Adding to Puerto Rico’s political value, Gov. Ricardo Rosselló is backing a plan to move the 2020 primary from early June to one of the final two weekends in March. That is the sort of action that usually grabs FHQ's attention. And rusty though my Spanish may be, there is no bill currently before the Puerto Rico Assembly that would shift the date of the presidential primary on the island. I have checked. So FHQ reached out to Caputo to see if there was any more light he could shed on the matter. While there is no bill with any language to change the June primary date to March for Democrats in the territory, Caputo shared with FHQ that there is a bill that may be used as a vehicle for pushing that change. S 1026, a still-active bill introduced in June 2018 by Senator Miguel Romero Lugo (PR-District I, San Juan), currently calls for a renaming of the presidential primary act and the addition of a requirement for presidential candidates to release five years of tax returns to appear on the primary ballot. The tentative plan is to amend that bill and tack on the Democratic presidential primary date change. The current statute treats the Democratic and Republican presidential primaries differently.1 The Republican primary essentially defaults to the first Sunday in March while the Democratic primary follows three months later on the first Sunday in June. In some ways the set up is similar to the primary scheduling in South Carolina where the two parties' primaries are typically on separate days. But in the Palmetto state those two contests have tended to be only a week apart in years in which both parties have active nomination races. Three months between contests in Puerto Rico is a bit different. But with this potential change -- if the bill above is amended -- the later Democratic primary would be nudged up the calendar into March, the same month as the Republican primary, albeit not on the same date. That would push another 51 pledged delegates into what is shaping up to the be the busiest month on the primary calendar. The presidential primary of the Republican Party will be held on the last Sunday of the month of February of the year in which the presidential elections in the United States are to be held, as long as it does not precede or coincide with the celebration of the presidential primary of the State of New Hampshire. If there is such a conflict, the presidential primary will be held on the first Sunday of March. The Democratic Party presidential primary will be held on the first Sunday of June, that same year. In case of opting for a political party affiliated by the alternative of Assembly arranged in sec. 1350 of this title, it will be celebrated on these dates. When and if the Puerto Rico bill in question is amended with a provision to change the date of the primary there, FHQ will add it to the 2020 presidential primary calendar. Hat tip to @heyitsfoxyyyy for bringing the Caputo piece to FHQ's attention. Legislation introduced this week would shift the presidential primary in Ohio from the second Tuesday after the first Monday in March to the first Tuesday after the first Monday in May. There have been other bills floating around during the 2019 state legislative sessions across the country, but none of them have so far called for a later new date for the 2020 cycle. This Ohio bill -- HB 101 -- changes that. Contrast that with the Republican-controlled state governments across the country. Their motivation is different. Protect the president? Then move back (and see the state party shift to a winner-take-all allocation method). Hurt the Democrats? Then move back and shift an important constituency concentrated in a particular region. Think about that SEC primary coalition from 2016. That could break up and push the votes of a valuable Democratic voting bloc -- African American -- to later in the calendar. That might affect some candidates more than others. Typically partisan actors on the state level leave well enough alone if their party controls the presidency. The motivation is just different for parties occupying the White House. And there has been more inaction than action in 2019 across the country in states whether controlled by Democrats or Republicans. But this Ohio bill fits the pattern outlined above: a proposed backward shift and a Republican-dominated legislature. Yet, there is a catch. This bill is not a Republican vehicle for broader calendar mischief. Instead, it is a Democratic-sponsored bill with an entirely different motivation; an administrative one. Ohio primaries are in May unless it is during a presidential election year. In presidential years, everything moves up to March. Rep. Jack Cera (D-96th, Bellaire) and his seven Democratic co-sponsors offered the bill because those March presidential primaries, according to Cera via BuzzFeed, "are an unfair burden on local elections administrators and candidates who have a narrower window to prepare for the next election." Election administration is a common counter to any presidential primary maneuvering, and this case is no different. But it is a harder case to make in light of the fact that Ohio has had a March presidential primary since the 1996 cycle. Two fewer months of preparation for elections administrators and candidates is not nothing, but it is a practice that one could argue has become institutionalized in presidential years over the last two plus decades. This would be another matter entirely if the Ohio presidential primary was on a different date than the primaries for other offices. That would entail additional preparations and costs associated with one more election. But Ohio primaries are consolidated. 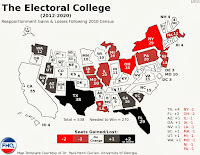 And 2020 is not a cycle like 2012 when, because of unresolved redistricting issues in the Buckeye state, the presidential primary was moved from March to May, then from May to March before it was moved from March to June and the back to March again (with May again at one time considered a potential landing spot). That was a burden to elections officials and candidates during 2011. Ohio having another March primary in 2020 does not meet the level of that sort of burden. Reasoning aside, this bill may not be high on the agenda of Republicans in control of the levers of power in Ohio state government. And no matter what Ohio legislators opt to do, both the March date and the targeted May date have regional partners. Michigan is scheduled to have a primary on March 10 and Indiana will hold a May 5 primary. Ohio has a history with first Tuesday after the first Monday in May presidential primary dates. The state conducted primaries in that position in both 1984 and 1988. This Ohio bill will be added to the 2020 FHQ Presidential Primary Calendar. Legislation is in the works in Utah to set the date of the newly (re)funded presidential primary in Utah for Super Tuesday 2020. Senator Curtis Bramble (R-16th, Utah/Wasatch), the floor sponsor of the House legislation two years ago that appropriated money for a 2020 presidential primary, is back to complete the task that was in 2017 left for the 2019 legislature to consider: where on the calendar to schedule the event. 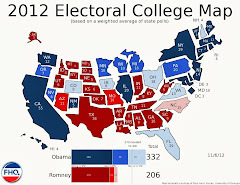 While Bramble is seeking to align the newly constituted presidential primary with other delegate selection events in at least 10 states, UtahPolicy.com reports that elections officials in the Beehive state are advocating for a later March or even April date. There is more open space on the 2020 calendar in April and the primary would not conflict with the state legislative session. Utah is no stranger to Super Tuesday. The state held a Friday-after-Super-Tuesday primary in 2000 alongside neighbors Colorado and Wyoming and moved the rest of the way up to Super Tuesday in 2004. The primary remained there as part of the de facto national primary that formed and took place on February 5, 2008. Technically that February date carried over to the 2012 cycle, but the legislature added an option to consolidate the presidential primary with the late June primary for other offices. Both the February and June options are now included in the state's statute creating a Western States Presidential Primary, but are only in effect if the legislature appropriates money to conduct the election. And it should be noted that both dates are currently non-compliant with national party rules. The February date is too early (and would fall the day after the caucuses in Iowa in 2020) and the June date is too late. That along with the lack of state legislative appropriation for a primary factored into the decisions by the state parties in 2015 to abandon primaries in favor of caucuses for the 2016 cycle. 2020 will be different for Utah. The primary option was funded in 2017, but no date was set then. Bramble's forthcoming legislation will begin those deliberations. But a Super Tuesday date would align the Utah primary with potentially the newly reestablished Colorado primary. A tip of the cap to Bryan Schott at UtahPolicy.com for sharing the news of Utah bill with FHQ. It was confirmed Friday that Minnesota will conduct its newly reestablished presidential primary on March 3, 2020, Super Tuesday. The confirmation comes just a week before a statutory deadline by which the two major parties were to have either jointly agreed to an alternative date or settled on the default first Tuesday in March position. The parties opted again for the latter, bringing Minnesota's primary in line with contests in at least nine other states. Ken Martin, chair of the Minnesota DFL Party, said he’s not dwelling on whether Minnesota will get lost in the crowd. But Minnesota is no stranger to Super Tuesday. 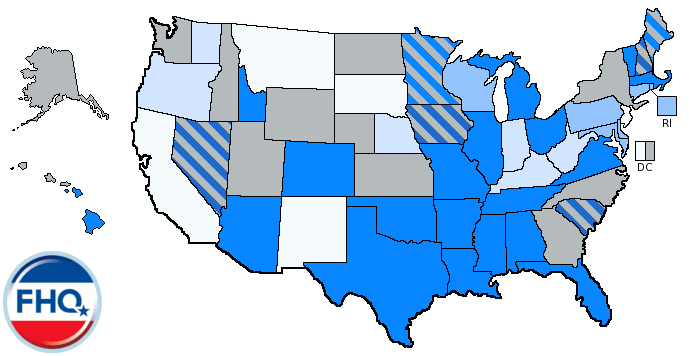 The caucuses in the state have been on Super Tuesday in every cycle since 1996 with just one exception.1 And that has meant being aligned with the likes of California and New York among others in 2000 and those same two heavy hitters and nearly half the states in the country in 2008. On the one hand there is lost in the shuffle, but on the other for small to medium-sized states, is giving voters a choice (or that is often the refrain from date-setting decision-makers). In the end, Minnesota winds up right where it was in 2016: on Super Tuesday. And while there was no movement of the date, there has been movement with respect to the mode of delegate allocation. The state has been one of several to make the leap from 2016 caucuses to 2020 primary. 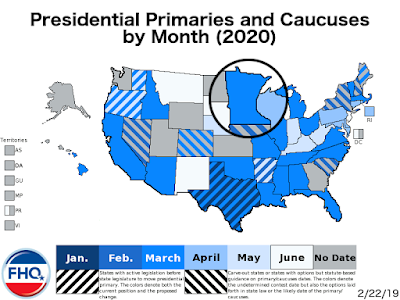 The finalization of the Minnesota presidential primary date is reflected on the FHQ 2020 Presidential Primary Calendar. Tip of the cap to Mike Taphorn for passing news of the confirmation on to FHQ. 1 In the transition from a window in which the national parties allowed February contests to one after 2008 when only March or later was within the rules, Minnesota in 2012 held February caucuses before Super Tuesday. But those caucuses were non-binding on the Republican side in a competitive contest and on the Democratic side where there was no challenge to President Obama, Minnesota Democrats got a waiver from the DNC to hold February contests but release the results in March. #InvisiblePrimary: Visible -- Is Bernie Sanders a Democrat Under the 2020 Democratic Rules? But since Sanders has now thrown his hat in the 2020 Democratic ring, since the rules have changed a bit since 2016, and since this keeps coming up on the areas of social media still relitigating the 2016 Democratic primary (and with greater frequency on Sander 2020, day one), FHQ will weigh in on the matter. But FHQ will weigh in with the goal of ultimately posing another, perhaps, more important question. 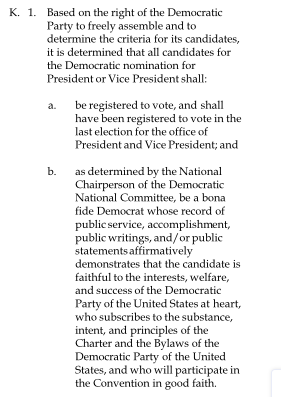 However, before that, let's first lay out what both the 2020 Democratic Delegate Selection Rules (Rule 13.K.1) and the Call for the 2020 Democratic National Convention (Section VI) say about who the party views as an eligible candidate for its nomination. Both offer discretion to the DNC chair to determine who is a "bona fide Democrat" and an overlapping definition of what that means. Basically, a Democrat in the eyes of the Democratic National Committee is someone "whose record of public service, accomplishment, public writings and/or public statements affirmatively demonstrates that the candidate is faithful to the interests, welfare, and success of the Democratic Party of the United States." The Call also adds that a candidate must affirm in writing that they are a member of the Democratic Party (something that does not require registration with the party), will accept the party's nomination, and run and serve as a member of the party. All of this is the same basic framework Sanders and the DNC agreed to during the 2016 cycle. But it has now been formally added to the nomination rules of the party. If Sanders qualified in 2016, then he will qualify for 2020. One member of the DNC Rules and Bylaws Committee placed some emphasis on the timing of the affirmation; that it is to happen upon the public announcement of candidacy. That is a fair point, but it raises a different question: Have any of the announced candidates followed this newly codified protocol and signed the affirmation form? The answer is no. Sanders may be under the spotlight, but he is not the only candidate who has to submit the form. And none have done so as of yet because the DNC has yet to distribute the forms to the various announced campaigns. That will happen at a meeting the DNC has set up for next week. But the initial question should be put to rest. Sanders is a Democrat under the new rules. 1. #StaffPrimary: Sanders adds a campaign manager. 2. #MoneyPrimary: The Vermont senator also had a productive first 24 hours on the fundraising front. 3. #EndorsementPrimary: And although the fundraising was a bigger signal, Sanders was able to point to a handful of meaningful endorsements on day one. Patrick Leahy was among them. The senior Vermont senator brings Sanders Senate endorsement total to one, the same number he had in all of the 2016 cycle. [Note: Sanders already had the support of Rep. Ro Khanna (D-CA).] While that continues the trend of primarily home state support for the announced candidates, it is not the show of force a candidate returning for round two might otherwise want in an attempt at unifying the party behind him. 4. Gov. Baker (R-MA) is not yet ready to line up behind Weld 2020. 5. Delaney keeps plugging away in Iowa, opening a field office in Waterloo. 6. Sure, Biden leads in a South Carolina poll (and one in New Hampshire too), but at what point do we stop saying either 1) this is a reflection of name recognition and/or 2) state polls are largely reflecting national polls at this point? Not yet. On a 5-4 party-line vote, the Washington House Committee on State Government and Tribal Affairs passed SB 5273 on February 19. The bill would move the presidential primary in the Evergreen state from late May to the second Tuesday in March. That provision saw wide support in the brief comments on the bill before the committee rendered its vote. Republicans on the committee balked at the unaffiliated voters votes not counting. While that provision has been advocated for by Secretary of State Kim Wyman (R) and saw similar Republican support in the state Senate during the bill's consideration there, committee testimony on both sides of the capitol has repeatedly warned that implementing such a measure would likely draw the ire of both national parties and force the state parties in Washington to move back toward caucuses in lieu of the primary option. The bill now moves, unamended from its Senate-passed version, to the floor of the House for consideration. It is not any secret that the Kamala Harris campaign is making every effort to make the senator's home state of California its strategic centerpiece. There is no lack of elected Democratic officials in the Golden state, and Harris has rolled out a steady drip, drip, drip of endorsements from statewide office-holders to those in the state legislature. In addition, her campaign is stocked with those seasoned in California politics. And it should be noted that her home state is a known ATM for Democratic presidential nomination fundraising; one where Harris has already shown some promise. In sum, that is a recipe -- home state with a natural fundraising base and elected officials and campaign staff are eager to get on board -- for an attempt at warding off the competition. But, of course, that is much easier said than done. While Team Harris is attempting to make California in 2020 to her what Iowa was to Tom Harkin in 1992, that is no small task. For starters, Harris is not to California now what Harkin was to Iowa in 1992: an experienced legislator. That has its pros and cons in presidential nomination politics to be sure. More importantly, however, California is not Iowa. There are too many delegates there for other campaigns to leave on the table; to cede outright to Harris. That will draw other campaigns in, but to what extent? "We believe the early primary, early voting, and the cost of communicating will make it virtually impossible for all but the top two or three candidates to play in the state in a meaningful way." There is a finite amount of money floating around out there, and two to three candidates (including Harris) making a legitimate statewide push in California sounds about right. Others may make a play at some specific congressional district delegates in the state, but that is a tougher move that requires the type of targeting, the know-how of which may be concentrated in only a few campaigns (the most resourced). But that is the way to "beat" Harris in California: a serious challenger or two and a death-by-a-thousand-cuts strategy from others. The goal? To minimize any significant delegate advantage the junior California senator takes from the state. The last two competitive Democratic presidential nomination cycles have seen candidates establish small but durable delegate advantages early on. Obama in 2008 used a caucus strategy along with a post-Super Tuesday winning streak through the remainder of February to develop a lead in the delegate count that he never relinquished. Similarly, Clinton's strength among African American voters in the 2016 SEC primary states laid the groundwork for a delegate lead that never really contracted between her and Sanders. If one is in the Harris campaign, then, California is absolutely part of a path of least resistance to a similar delegate advantage (assuming there are also victories -- actual or relative to expectations -- in the early states). But that sort of 80-100 delegate advantage in California alone is unlikely. In the past, it has required the winning candidate to approach or exceed 60 percent of the vote statewide in a contest with a significantly winnowed field. Now, strange things -- atypical to past nomination cycles -- may occur with a less winnowed field and a 15 percent threshold stretched across the allocation of statewide and congressional district delegates. However, even if the opposition to Harris is able to minimize the delegates she gains from the Golden state any advantage may play into a larger delegate acquisition elsewhere on Super Tuesday. And if other candidates are drawn to spend money to close the gap with Harris in California, then those are resources not being spent elsewhere. It is that zero-sum game that provides Harris with a structural, calendar-based advantage at this point. But it is an advantage that probably cannot hold up or be fully realized without some success first in February. And that success is built during the invisible primary. 1. Announcements: Sanders is in, skipping the exploratory phase counter to previous reporting. Weld is exploring on the Republican side. Tammy Baldwin is not running. Merkley signals that perhaps he is inching away from a White House bid. 2. #MoneyPrimary: Sanders has also joined the group of candidates who, after launch, have quickly taken in donations from all 50 states. Bullock's PAC has done some limited spending in the early states. Brown becomes the latest Democrat to shun corporate PAC money. One outside group is working to insure that a black candidate is on the Democratic ticket. 3. #StaffPrimary: Klobuchar adds staff in Iowa. And she is not the only one with a budding team in the Hawkeye state. Iowa is not the only early state where there is a battle for staff. South Carolina is witnessing its own race for campaign talent. Campaigns are looking beyond the first states too. Bringing on staff in California is a signal of the intricacies the Golden state adds to the early half of the 2020 calendar. 4. #EndorsementPrimary: Harris continues to notch notable California endorsements, adding the support of Gov. Newsom, Rep. Lee and activist, Delores Huerta. Delaney continues a small scale build up by adding more county chair endorsements in Iowa. And the chase is on for the endorsements of the newest members of Congress; the newest superdelegates. 5. Travelogue: Candidates spent quite a bit of time in Iowa and New Hampshire over the long the Presidents Day weekend. Among the candidates who have not been to either of the first two states yet, Bennet will make his maiden trip this week to Iowa. Jim Clyburn's daughter has become a go-to shepherd for candidates trekking to South Carolina. In Vermont, meanwhile, there has been discussion about resurrecting a bill to move the Green Mountain State’s presidential primary to the same day as the New Hampshire primary. But no bill has been introduced, according to the Vermont Secretary of State’s office. State Sen. Anthony Pollina, a Democrat, introduced such a bill in 2015, but it went nowhere in the Vermont Legislature. In an interview Wednesday, Pollina said he has heard “snippets of conversations that maybe we should look at it again.” But he said it’s unlikely that he will introduce a new version. “It got such a negative reaction here last time,” Pollina said. “I think, frankly, it would be a great idea. And our citizens agree, but not a lot of policy-makers agree. Vermont did, in fact, have bills introduced in both the state House and Senate in 2015 that would have required the Vermont secretary of state to set the date of the Green Mountain state presidential primary for the same date of the New Hampshire primary. But importantly, that decision would be intended to be made after New Hampshire settled on a date. No, neither bill went anywhere in 2015, nor did a resolution calling on the Vermont secretary of state's office to study the possibility of such a move to align primaries with New Hampshire. There may be whispers of a renewed push to make such a change in Vermont for 2020, but it also looks as if the legislature remains opposed to the idea. The Vermont presidential primary is currently scheduled for Super Tuesday, March 3, 2020. New Hampshire can rest easy again. Yes, the Iowa Democrats released their draft delegate selection plan this week, and the new process was seemingly distinct enough to avoid any future "similar contest" designation from Secretary of State Gardner. But the Granite state also lost a potential threat in Arkansas this past week as well. Legislation introduced last week in the Natural state would have scheduled the Arkansas primary for the second Tuesday in February, the date tentatively reserved by the national parties for the New Hampshire primary. No, the threat was not much of a threat to the first-in-the-nation status New Hampshire has enjoyed. Secretary Gardner, after all, could easily move the primary in the Granite state to an earlier date in response. But with an amendment to that Arkansas legislation (SB 276), both New Hampshire's status and tentative position on the calendar are in the clear. And Arkansas would, if the amended bill passes and is signed into law, avoid any national party penalties as well. The amendment shifts the proposed preferential primary date -- the initial round in Arkansas -- to the first Tuesday in March with the general primary -- the runoff round for other offices -- following four weeks later. This reverses the sequence that has been established in Arkansas law for years; that the runoff is set first and the initial round is set some set number of weeks before that general primary. It is a counterintuitive set up, but one that is more natural under the proposed amendment. Although the bill was twice on the agenda of the State Agencies and Governmental Affairs Committee in the Arkansas state Senate for an initial hearing this past week, it was bumped down the list both times. Part of that was to allow for the amendment to be added before the bill was heard. Now amended, the new version is now on the committee agenda for the coming week. The question then becomes whether Arkansas will join other states on Super Tuesday. The Democratic National Committee on Thursday filled in the remaining details about its upcoming initial round of presidential primary debates. Thus far, the party had announced the scheduling of the debates for the rest of 2019 and into 2020, but had remained largely mum on how candidates could qualify for entry other than to generally say entry would happen through polling and "grassroots fundraising". That changed with today's announcement from the party. For the most part, the DNC followed its rubric from 2016 with respect to the polling metric. Candidates can still qualify for a spot in the debate by registering at least one percent in at least three polls of which the party approves. But in another innovation for the 2020 cycle, the DNC also added another marker candidates can hit to gain entry to the first debate(s). Modeled after the federal matching funds system in some ways, the DNC will also allow candidates who demonstrate a fundraising base of 65,000 donors spread across at least 20 states (with a minimum of 200 donors per state) into the debates as well. That is a new spin on the matching funds system. The focus there has always been on the amount of money raised; at least $100,000 or $5000 in each of at least 20 states. But for debates entry, the metric is slightly different. The DNC is requiring some demonstration of grassroots support via fundraising, and is thus more focused on the breadth of the network of donors rather than the depth of that fundraising (the warchest accrued). Kirsten Gillibrand, Kamala Harris and Elizabeth Warren, for example, have all touted the fact that they raised money from all 50 states in the immediate wake of their announcements. Each is also above one percent in most polls that have been conducted to this point in the race. And that does raise a question about where the bar is set for debates entry and whether there might be too many candidates to qualify. The DNC answered that too. Neither of the two randomly drawn debate fields for the first and second debate rounds in June and July will have any more than ten candidates on the stage at once. And if too many candidates qualify, the party will accept candidates who have met both qualification standards and use polling to differentiate further if necessary. Left unanswered by the DNC is whether the qualifications standards will increase after July. The threshold announced will only apply to the first debates. But will the bar be raised when debates resume in September and incrementally go up thereafter? The debates will likely see the 20 slots filled in June and may serve at least some winnowing role as 2019 progresses. But if the threshold to qualify for debates progresses as well, then that winnowing role may be enhanced. What Will a "Grassroots Fundraising" Threshold for Entry to Democratic Primary Debates Look Like? 2. Bill Weld is going to have something to announce at Politics and Eggs. 4. Swalwell appears to finally be on the verge of jumping in. 6. Martha Coakley is raising money for Harris. As signals go, this is a former Massachusetts attorney general helping someone other than the Massachusetts senator in the race. #MoneyPrimary #EndorsementPrimary? The exception to the single annual primary election date in the state will be for the presidential primaries every four years. The month and date of next year’s presidential primaries are still to be determined, Penziul said. New York’s 2016 presidential primaries were held in April, but the contests are likely to be moved up in 2020. Technically, New York has a spring primary to which the presidential primary is tethered scheduled for the first Tuesday in February. But the protocol in the state over the last two cycles (2012 and 2016) has been to decide on a date in the late spring or early summer in the year prior to the presidential election. A presidential primaries date is settled on then, but has also only been determined for the upcoming cycle. A sunset provision has been included in both the 2011 and 2015 laws that set April dates. That means that the New York presidential primary has snapped back to February for the 2016 and 2020 cycles. And this is the first indication that the state may shift back in the calendar a little less than it has in the recent past. A February date would not be compliant with national party rules, so New York is likely to join the logjam that has already formed in March 2020. But whether that means joining, say, California and Texas on Super Tuesday or carving another spot later in March remains to be seen. Over the weekend, Amy Klobuchar announced her intentions to make a run at the White House. Some of the reaction has focused on a campaign in its infancy and its early focus on midwestern states. That is a reasonable general election strategy in light of Iowa, Michigan, Ohio and Wisconsin flipping to the red column and the loss of ground the party incurred in Minnesota (while still holding on there at the presidential level). But as FHQ pointed out, this is not exactly a sound strategy in the presidential nomination process. While Iowa certainly kicks the process off, the midwest is underrepresented early in the 2020 presidential primary calendar. In some ways, this raises the stakes for Klobuchar in Iowa, but that is not anything that is unique to her. Many candidates will run Iowa-or-bust campaigns. But not all candidates will attempt to make a win in Iowa, whether outright or relative to expectations, about their strength in the midwest. Indeed, given the calendar, some candidates may point toward their performance in the Hawkeye state as appealing to a particular constituency within the broader party network that better aligns with the next contest or round of contests. Yes, FHQ is oversimplifying things here, but with a purpose in mind. Here is the thing: Klobuchar may get some helpful calendar clarity within a few weeks. Although the next midwest contests after Iowa are technically Michigan and Ohio on March 10, Minnesota may join Super Tuesday on March 1 of this year. Yes, the Land of 10,000 Lakes has made the transition from caucus to primary for the 2020 cycle, but part of that former caucus law carried over one important aspect of the caucus process: the scheduling portion. As under the old caucus system, the parties have the option of selecting and agreeing on an alternative date for the primary. If the two major parties either cannot settle on an alternative or refuse to select an alternative, then the date of the new presidential primary is set for the first Tuesday in March. 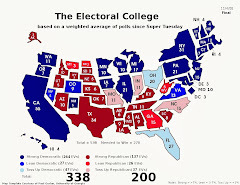 That would add Minnesota into the mix on Super Tuesday alongside California, Texas, North Carolina and others, and perhaps provide a midwestern -- and home turf -- contest for Klobuchar (or others) if they are able to survive the first month of contests. 1. In candidacy announcement news, both Warren and Klobuchar have officially thrown their hats in the 2020 ring. Bloomberg follows O'Rourke in setting the end of February as the deadline for a 2020 decision. Sanders, on the other hand, is likely to go the exploratory committee route in February before later launching a full-fledged campaign. 2. Several others are making moves on the periphery of the invisible primary. Moulton is mulling, De Blasio is going to take a trip up north to the Granite state (or not), Holder is set to give a speech in Iowa (and announce by the end of the month), Bennet is running early sate digital ads, Abrams is casting a wide net following her State of the Union response, and Swalwell continues to say a decision on his 2020 plans is close. 3. And then there are folks like Mitch Landrieu who are seemingly passing on a 2020 bid. Joe Kennedy fits that category as well. And both were really only mentioned as possibilities without doing many of the things associated with folks who run or consider running. 4. On the travel front, Klobuchar (see above) is seemingly making the midwest a focus with treks to Iowa and Wisconsin planned on the heels of her announcement. Gillibrand made her maiden voyage as a candidate to the Palmetto state, and Hickenlooper stopped in there as well. Buttigieg and Gabbard have hit Iowa following their announcements and Bullock is heading back that way for the first time since last August. 5. In the #MoneyPrimary, Klobuchar has joined the group of candidates swearing off corporate PAC money for the 2020 cycle. California remains a presidential nomination ATM, and that includes Hollywood. Booker has a super PAC aligned with his run, but does not want it. [The New Jersey senator also has a trip planned to fundraise in the Golden state.] And there is another story about Democratic donors playing the waiting game. 6. Harris continues to make moves in the #StaffPrimary. This time adding two more to her Iowa staff and both have experience with either Clinton's or Obama's past campaigns. The California senator has also hired someone with some fundraising chops, tacked on another veteran hand in New Hampshire, and added to her South Carolina operation. Harris is not alone. Warren, too, is assembling a team in the Hawkeye state. Even Hickenlooper has gotten in on the action in Iowa. 7. There still do not appear to be many breaks in the early #EndorsementPrimary trend. Announced candidates so far are getting support from home state elected officials. Klobuchar had a big showing of elected official support at her snowy rollout. Warren picked up the support of Joe Kennedy. Harris continues to rollout home state endorsements. Even Brown, through the Draft Sherrod movement, seemingly has some Ohio-based support. Gillibrand has thus far had no such luck. Not only is Governor Cuomo more focused on Biden's potential candidacy, but Rep. Carolyn Maloney (D-NY) appears to be following suit. 8. Meanwhile, the early states have not really heard much from Biden, but folks on Capitol Hill have. Strategists, however, have their doubts about a Biden run. 9. Money is not the only thing the candidates are after from California. Their campaigns are trying to figure how the Golden state fits into their 2020 strategies. That is an important story, but there is much to the consideration about how to tackle California. 10. Yes, the idea has been floated, but according to the South Carolina Republican Party, nothing has been settled with respect to canceling the presidential primary there in 2020. That decision will come later this year at the state convention. 11. Dave Hopkins nudges back on lanes and other schema for assessing the progress of the presidential nomination process. 12. Finally, Iowa Democrats have a draft delegate selection plan, and it looks like New Hampshire is satisfied that virtual caucuses do not equate to a "similar contest". Dave Redlawsk provides a synopsis of the changes and Jonathan Bernstein gives a big picture reaction as well. To say that primary scheduling in Washington, DC has been chaotic in the 21st century is perhaps an understatement. It is an understatement because the District has not had a primary date carry over from one cycle to the next since it used the first Tuesday in May position in both 1996 and 2000. That's right. In every year since the year 2000, the District of Columbia has had a different primary date than the previous cycle each time. That is a lot of movement. And add to that the fact that in 2012 the council in DC passed legislation that ultimately became law to consolidate the primary election for other offices in the district with the presidential primary. If there was a regular rhythm to the nomination processes in the capital before the turn of the century, it was a steady May date for the presidential primary and a September date for all other offices. What is the regular rhythm of the 21st century? Either there is no rhythm, or it is that the dates change every cycle. And now officials in Washington are again considering a change to move the primary from June to April where it may once again coincide with contests in the mid-Atlantic/northeast. Those concurrent regional primaries involving DC happened with the Potomac Primary in 2008, alongside Maryland and Virginia, and with Delaware and Maryland in 2012. At a meeting Thursday, the D.C. Democratic State Committee will consider whether to recommend moving up the District’s primary from June 16 to April 28, or some other early spring date. “If you want to be competitive in the democratic process, you need to be early up,” said D.C. Council member Jack Evans (D-Ward 2), who represents the District on the Democratic National Committee. Of course in the case of the Washington, DC primary, earlier is compliant. After moving the primary back a week to the third Tuesday in June during its 2017 session to accommodate school schedules in the district, the primary fell out of compliance with both parties 2020 rules. The primary is too late and would potential open the parties in the District to penalties from the national parties. A move, then, would be necessary unless petitioning for a waiver was successful. But first the council in DC will likely take up legislation to move the primary. Democrats in the District took up the idea at their state committee meeting, but tabled it until March. A recommendation from DC Democrats will likely prompt some action on the council. This morning new legislation was introduced in the Arkansas state legislature to move the May consolidated primary -- including the presidential primary -- into February. SB 276, filed by state Senator Trent Garner (R-27th, El Dorado), would push the general primary from the third Tuesday in June to the first Tuesday in March. But here is the catch: the language of the nomination process in the Natural state is unconventional. The general primary refers to a runoff election, but that is the election described/scheduled in the current elections statute. The scheduling of the preferential primary -- the first round of the nomination process -- follows from that general primary date. Currently, that occurs four weeks prior to the general primary on the third Tuesday in May. But while Garner's bill would move the general primary to a date compliant with the national party rules, again, it is a runoff. Under the legislation, the preferential primary -- the one that matters here -- would occur three weeks prior to the first Tuesday in March. That falls on the second Tuesday in February. ...the same day as the date on which the New Hampshire presidential primary currently and tentatively scheduled. Is this a true challenge to the New Hampshire primary? Not really. First, Arkansas had a difficult enough time moving into March for the 2016 cycle to join the SEC primary. That entailed a last minute deal being cut in the state Senate during a 2015 special session to get a temporary primary date change approved. And that was after a similar measure failed during the regular session that same year. Then, efforts two years ago to move the primary back to March for 2020 again fell flat. These bills have always found resistance in the state Senate and over moving the primary into winter which elongates the general election campaign. It is not a financial cost, then, that state senators have balked at in the past, but rather a change in the regular rhythms of Arkansas elections for offices up and down the ballot. And it has not helped that the past moves -- 1988, 2008 and 2016 -- have not delivered the sort of attention decision makers in the state have promised and/or desired. Now, add to that an additional layer: encroaching on New Hampshire's turf if this bill becomes law and violating the national party rules on scheduling in the process. The penalties -- losing half of the Democratic delegation and around two-thirds of the Republican delegation -- do not make the move attractive. To add insult to injury, Garner's bill is not aggressive enough. It would shift the Arkansas primary into the tentative position reserved for the presidential primary in Granite state, but it certainly would not keep the New Hampshire secretary of state moving the primary there to an earlier date after the Arkansas legislature has adjourned and is powerless to respond. It is that ability that has helped keep New Hampshire at the front of the presidential primary queue. This may be another "flamethrower" but it is likely to meet the same fate as those in the past. The Arkansas bill has been added to the FHQ 2020 presidential primary calendar.